CCAFS – Satellite Alert Facility – RUSH, Inc. This $5.2 million dollar project was a one-step design and construction project. 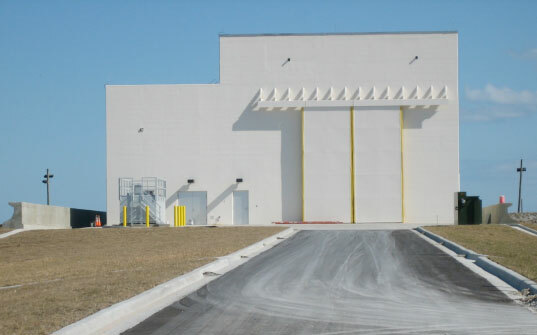 The 20,000 square foot two story building was designed around specific user criteria which will serve as the administrative office building for contractor support groups working for 45th Launch Control Systems. Construction consisted of tilt up panels, standing seam metal roof, slab-on-grade, raised flooring system, parking lots, elevator, and one interior stair that also included areas of open administrative office space, individual offices, conference rooms, and support spaces. All on-site utilities were brought into the construction area to include water, sewer, storm, electrical, and a new packaged lift station. The support spaces included mechanical, communication, and electrical rooms. This project building was also designed to meet U.S. Green Building Council (USGBC) Leadership in energy and Environmental Design (LEED) Gold Certification.